Every year, nearly 6 million vehicles are either totaled or stolen. Most insurance plans only cover the market value of the vehicle. However, you can still owe more on your loan than your vehicle is worth. This creates a GAP. You will be responsible for paying the difference and the deductible on your insurance. If you do not pay the difference, your credit will more than likely be adversely affected. 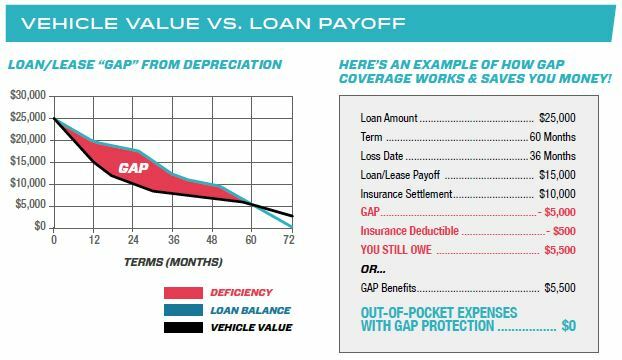 By including GAP, you protect yourself by covering the amount between what you owe, and the market value of your vehicle whether your vehicle is leased or financed and, in some cases, covers your insurance deductible. Speak with your Trevino’s Auto Mart Representative about whether you should include GAP with your purchase! Come see the best selection of used cars in McAllen, TX at Trevino's Auto Mart!